Information on German, and English production is fairly well documented, although sources often differ, but there is very little on Irish and virtually nothing on Argentinean production known to the Club. Identifying the various models is not always straight forward, so this does not purport to be a definitive listing. 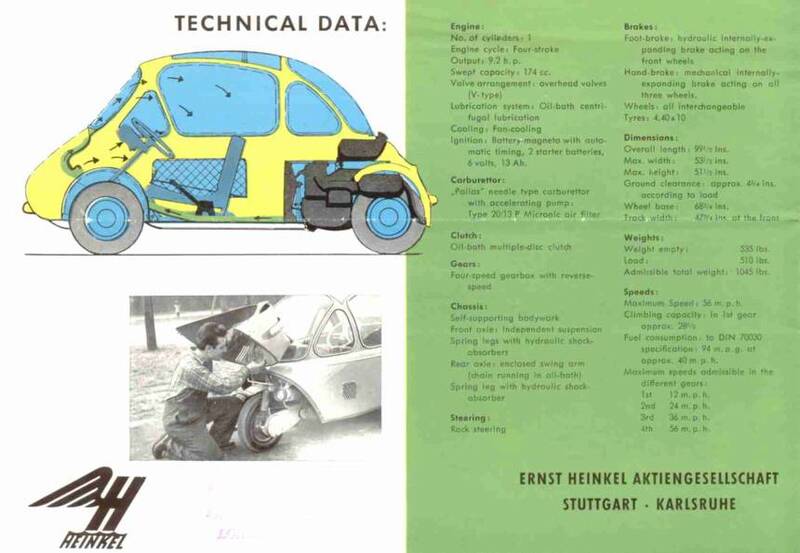 More details on the specification of the cars appear in ‘Exploring the Brochures of Heinkel Trojan Cars’ available from the Club. It is believed that a total of 11,975 cars were produced in Germany between December 1955 and June 1958 at the Heinkel factory at Speyer. There were three main types; Type 150, a three wheeler, initially with a 174cc engine, later increased to 198cc; Type 154, a four wheeler, initially with a 204cc engine, later reduced to 198cc and Type 153, a three wheeler with a 198cc engine. Production started with the Type 150, the Type 154 being introduced in October 1956. It is thought that Type 150 and 153 cars were produced concurrently. There were at least two, and probably five, versions of the 174cc, Type 407, engine fitted to the Type 150 cars. Siba and Bosch dynastarts were fitted on all types of engines and were fitted to both scooters and cars. Early cars had a rod operated gear change, this was changed to cable operation from around engine no 482000. Type 150 B-0 cars all have chassis numbers in the series 30####, the highest on the Register being 305609, they were all fitted with 174cc engines, mostly of Type 407 B-0 having numbers in the series 48####. However some later cars were fitted with Type 407 B-1 engines in the 49#### series. Type 150 B-1 cars all have chassis numbers in the series 35####. 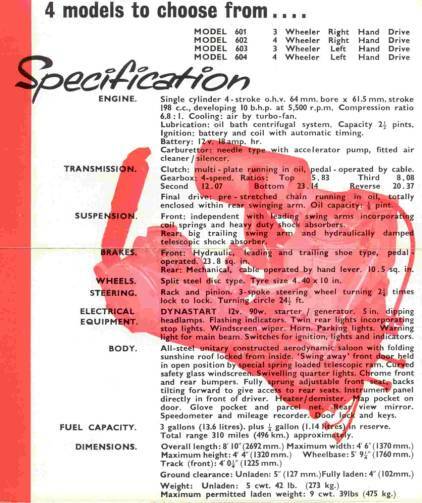 According to Glasses Guide the 198cc, Type 408 B-2, engine was introduced from chassis number 350961. Before that a mixture of 48#### and 49#### series engines appear to have been fitted randomly. In Germany production of 174cc cars ended in February 1958 and 198cc cars in June 1958. To complicate matters further, Type 150 B-1 cars were assembled in Eire from parts manufactured in Germany. It is not known how many, or even how to differentiate between German and Irish assembled, as opposed to Irish produced cars, from either the chassis or engine numbers. There were probably three versions of the Type 408 engine fitted to cars. The new engine was a bored out version of the Type 407, retaining its 61.5 mm stroke, this increased power to a claimed 10 hp at 5,500 rpm. The first Type 408 engine, the B-0 retained the three bearing crankshaft arrangement of the original 174cc engine, the other versions had a two bearing crank. Other modifications including the introduction of a four plate clutch with diaphragm spring in place of the three plate and coil spring version. The 408 B-0 was fitted with a 65mm piston giving a capacity of 204cc. It is thought that this was only ever fitted to early four wheel cars. It was considered that the capacity of the engine had been increased too much, so the standard bore size was reduced to 64mm for the Type 408 B-1 and B-2 engines. However, it must be remembered that a large number of Type 150 cars were fitted with 198cc engines with numbers in the series 515###. The main difference between the Type 150 and 153 cars is not known but it is not the introduction of the larger engine as the parts book suggests. Heinkel produced a number of prototypes, including a right hand drive version. This differed from the later Trojan cars by having the door hung on the left. The photograph is reproduced by kind permission of the German Heinkel Club. The first imports began in July 1956. Noble Motors Limited, of 211 Piccadilly, London were the concessionaires. The list price was £398 15s 0d. including, spare wheel, heater demister, front bumper and purchase tax. The cheapest Ford at the time was the Popular at £443 17s 0d. The cars were initially brought in through London Docks at the rate of around 20 a month. However, following the closure of the Suez Canal, the thirty percent increase in the price of petrol and the introduction of rationing, demand took off. So much so that cars were flown from Hanover to Croydon by Dakota, five at a time, on a daily basis. From February 1957 consignments of 60 cars were shipped through Rotterdam every ten to twelve days until demand slowed in the summer of 1957. The total number imported to the UK before production transferred to Ireland is not known but thought to be a significant proportion of production. In addition to good fuel economy, the cars attracted a reduced rate of Road Fund Duty of £5 rather than £12 10s for a normal car. 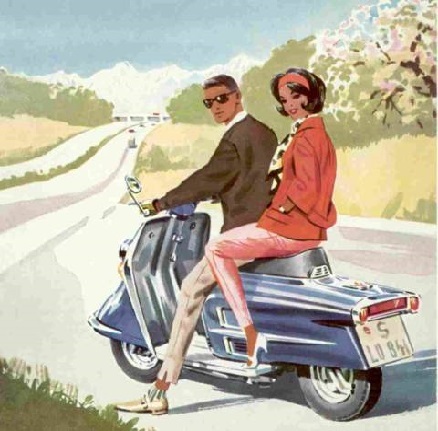 An unaccompanied learner driver could also drive them, provided the reverse gear was made inoperative, as they were then classed as a motorcycle combination. Very little is known about production in Argentina. Documents held by Trojan Limited refer to the sale of 2,500 kits of parts to Los Credos, in Argentina. They also refer to an enquiry for an additional 600 kits. There is no evidence that these additional kits were supplied. Even if the kits were exported it does not necessarily mean that they were all built and sold. There are three Argentinean cars on the Register with chassis number ranging from 857 to 3244 with claimed dates of manufacture between 1959 and 1961. 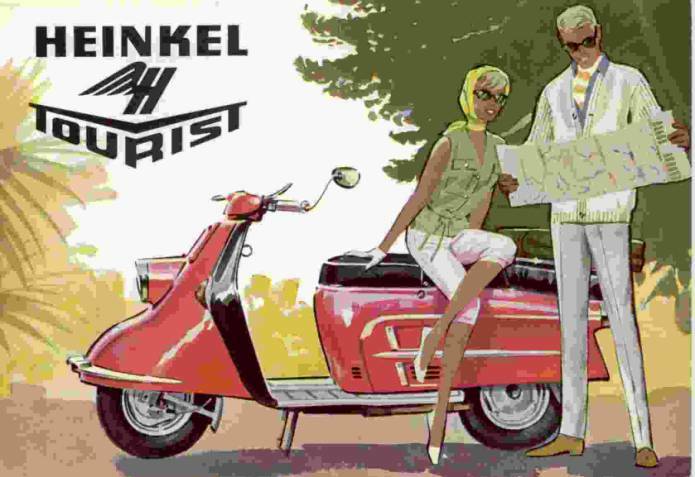 If Heinkel supplied a production line and some kits direct in 1957/58, before those supplied from Ireland then a production of over three thousand, is consistent with the above information. It has also been suggested that production was as low as a hundred before the Heinkel company stopped production because of poor build quality. Initially cars were assembled in Eire from parts manufactured in Germany. The cars had chassis and engine numbers in the same series as the German cars and it is not know how many were built before the production line was moved to Dundalk in the middle of 1958. Full production in Eire is thought to have taken place between October 1958 and Early 1961. Their system of chassis numbering appears to have used six or seven digits. The first three being 153 for a three wheeler and 154 for a four wheeler. The 153 and 154 models do not seem to have had separate series of numbers. According to a Trojan internal memo the last chassis produced in Ireland was 6486. The chassis plate is located on the top of the right hand side wheel arch. 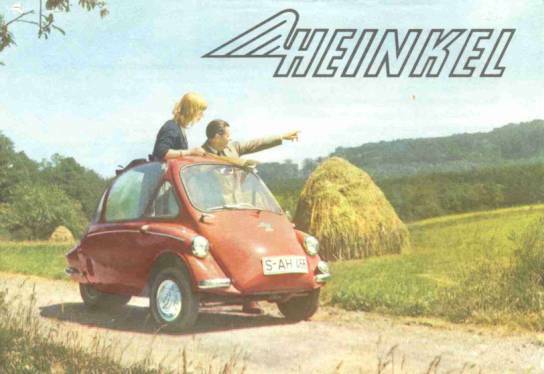 There is evidence that Heinkel Ireland produced at least two prototype vans. The one in the photo was probably sold to Trojan when they bought the production line and used it in their advertising (It has an Irish number plate). A second with top opening rear door was exhibited at the Dutch Motor Show in February 1959. They also produced at least two and possibly three Sports (convertible) prototypes. One was produced by International Sales in London and shipped to Dundalk for evaluation where at least one more was made and used in Eire. Engines were still supplied by Ernst Heinkel Ag and it is thought all were 198cc of 408 B-1 (four wheeler) or 408 B-2 (three wheeler) specification. Engine numbers fitted to early cars follow the German sequence indicating that stocks of pre-numbered engines were bought along with the production line. Later engine numbers are seven digits starting with a 1, the last six numbers appear to conform with the series given for German Production above. As part of the transfer of production to Ireland the world wide marketing rights were taken over by International Sales Limited of Dublin, who imported cars through their London office. Again the total number imported is not known, but a substantial proportion of production is likely to have ended up in UK as they did not sell well in Eire. Another important export market for the Irish Heinkel was Sweden. The Club Register shows one four wheeled Heinkel Ireland in the UK and a further five in Europe, production being predominantly three wheelers. According to Glass’s Guide the Trojan chassis numbers start at 7001, this is confirmed by the Trojan’s records. The first right hand drive car is 8182. The highest number, according to a Trojan Dealers Information Sheet, is 13179. Using the above numbers and assuming there were no gaps, gives a total production run of 6,179. The vast majority of production was three wheel cars. Some sources say that the right hand drive version was introduced in an attempt to boost flagging sales, but perhaps Trojan’s intention was to produce right hand drive from the beginning but, needed to use up left hand drive parts bought from Ireland. There does not appear to be any way to determine whether a car is left or right hand drive from the chassis number. Engine numbers follow the Irish pattern of a seven digit number starting 152#### for the 2,674 engines bought from Ireland. Thereafter engines were numbered 3-####, for three wheel cars and 4-#### for four wheelers. These engines were purchased directly from Heinkel by Trojan and include changes to specification, including the reintroduction of the Siba dynastart and changes to the gear box components. As Heinkel engineers did not approve of some of the changes insisted on by Trojan they would not guarantee their engines so Trojan took on the responsibility for all warranty claims. 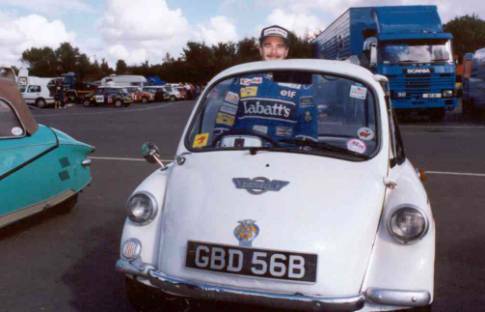 According to Trojan archive material a total of 19 vans were produced, all three wheelers and right hand drive, the project was shelved when Customs and Excise refused to exempt them from purchase tax. One was sold to Singapore, which has recently surfaced in Malaysia, the others in the UK between November 1962 and some time in 1963. Both three and four wheel convertibles were also available. At least one three wheel prototype was produced and used in Trojan’s promotional material. It is not known if any others were produced. The small additional price probably meant that Trojan would take the roof off for anyone who wanted an open car. According to Trojan’s records only five model 602, right hand drive four wheel, cars were produced. Two were sold in New Zealand, one each in UK, South Africa and Singapore. It was thought that all had been lost until 1995 when one surfaced in New Zealand. Trojan Limited’s racing heritage, they went on to build sports and racing cars for McLarren and are still in business restoring them! 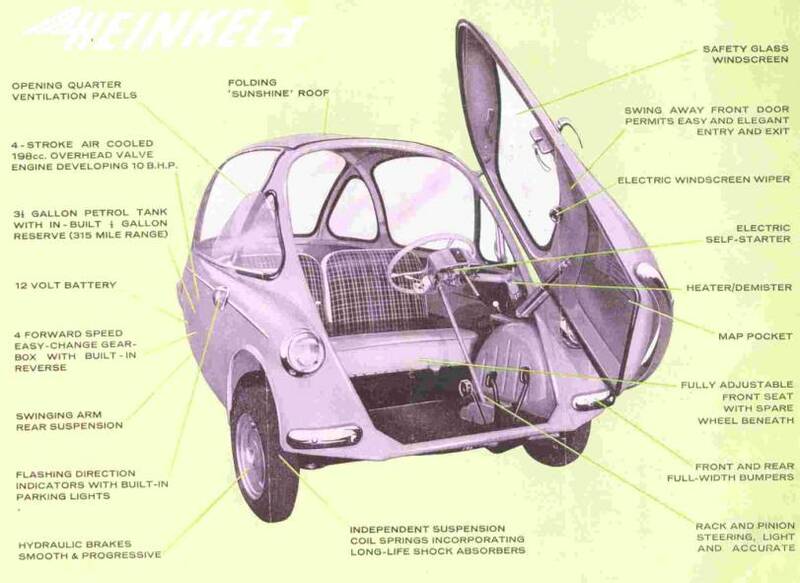 From an early Heinkel Brochure – Note the car is a four wheeler. 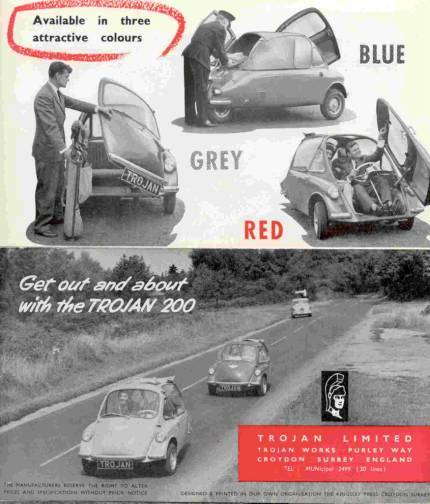 Extract from an early Trojan Brochure – Note the cars are left hand drive! Trojan Limited’s racing heritage, they went on to build sports and racing cars for McLarren and are still in business restoring them!